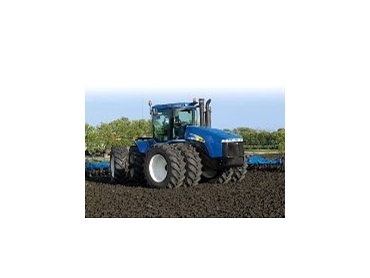 New Holland’s new four equal wheel drive Series T9000 tractor to be released mid year is set to impress with new higher levels of power, torque rise, comfort and control. With chassis and axle sizes matched to horsepower and performance expectations, the Series stands out from its competitors. Three frame sizes across the T9010 to T9060 model range ensure rugged and robust tractors ideally weighted to deliver excellent traction in the most demanding applications. “Three chassis classes across the Series T9000 4WD tractor range ensure that the tractors better match today’s demanding heavy-duty agricultural and commercial uses,” Don explained. Horsepower ranges from 280 Hp up to 530 on the largest model. An impressive power growth of up 54 Hp and a 40 per cent torque rise ensures the Series has the capacity to pull large, heavy equipment, even in tough conditions. The axle housing is also matched to horsepower. “So the more horsepower you need to put to the ground, the bigger and stronger the components,” Don said. Pull performance and operator comfort is delivered via a long wheel base, depending on the model, ranging from 353 cm to 391 cm and a centrally mounted drawbar helps with load distribution between front and rear wheels, ensuring stability, and enabling the T9000 to deliver power where it counts – at the drawbar. The massive power of the Series T9000 is matched by transmissions that provide a choice of work speeds and smooth-shifting performance. A 16x2 full powershift or 24x6 Hi-Low synchroshift transmission is available. The Custom Headland Management System, standard on powershift models with performance instrumentation, can be easily programmed to make complex headland turns a snap. “One switch controls as many as 30 functions such as remotes, throttles, gear shifts and 3-point hitch (if equipped) to save valuable time at every turn,” Don said. The flexible 24x6 Hi-Low synchroshift transmission, with nine speeds available, is fully synchronised to allow easy shifting on the go with a rolling load. For even greater convenience and control, T9000 tractors are available with factory-installed IntelliSteer auto-steering system “The system automatically guides the tractor in straight lines with an accuracy of 2.5 cm at speeds up to 29 km/hr,” Don said. A multitude of functions can be performed simultaneously without sacrificing performance. Due to the flexible hydraulic system, MegaFlow, which pumps up to an industry-leading 356 litres per minute through two separate hydraulic pumps to meet the demand of power-hungry implements such as air seeders and laser land-leveling equipment. Comfort is also ensured with a quiet, spacious cab featuring a large workspace and finger-tip controls. “The cab offers unmatched visibility and exceptional comfort is delivered via the AutoComfort seat which automatically adjusts to provide shock absorption on uneven ground,” Don said. The first units should arrive mid-May. Speak to your New Holland dealer today to secure a unit early.